I haven’t reviewed a Magento host on my blog for a long, long, time. That’s not because I haven’t had a bunch of companies ask me to, but because none of them offered anything really compelling or different to my go-to-magento-hosting-recommendation, Nexcess. Well, that was until a few weeks ago when MageMojo set me up with a demo account and invited me to take a test drive of their new Magento optimized hosting environment. A few features the Mojo team mentioned piqued my interest, so here I am, putting their Magento hosting platform to the test and reporting my findings. Oh, and the free hosting, MageMojo have offered to give away 12 months of free Magento hosting as part of this review, that’s over $700 worth of magento hosting, quite a generous offer. Seeing as there’s a few hundred eager Magento users and developers that come by here, I thought it’d be a great prize to offer all of you. You have to read to the end to find out how to win it, hah! I received an email from a fellow Magento developer asking about hosting Magento in New Zealand – this post is about that email and my response because I think it will be useful to others asking the same questions. All of the Magento stores I’ve built to date have been overseas (read: not in New Zealand) – my experience so far has only been with building low latency sites for American customers and UK/Europe customers. The reason for this is that at World Wide Access we recognize the importance of an in-country webstore presence to customer experience (bandwidth and latency). A while ago a slipped a bonus point question/jibe into one of my reviews for Magento hosting. Justin has cleverly called me on it, so as promised, you should check out Fat Cows eco friendly web hosting. Oddly enough their hosting does actually look interesting, the idea of wind powered green hosting, isn’t one I’d heard of before. What happens on non-windy days though? (I’m guessing they don’t rely soley on wind!) But they could make that clearer on the site. Anyway, cool idea, if you want hosting for a Magento webstore with a green/eco point of difference then it’s probably a good option. You can then brag about it on your site, give you customers a warm fuzzy feeling! Go Get It! Right, so after over a month of putting this off I’m finally going to start writing some Magento Hosting reviews. The first is for Simple Helix. You might remember way back in April when I said I would be reviewing a few Magento hosts, and also running a free Magento hosting competition. The competition is now over and I will be announcing the winners shortly, thanks to everyone who entered! I’ll compile the list of hosting annoyances you sent in and post it here shortly too. Just to re-iterate my thanks to the two hosting companies that put up prizes, A2 Hosting and Nexcess Hosting. Enough about the competition, on to the Magento hosting review of Simple Helix hosting. I look at an installation from the point of view of someone doing them all the time. There are a few things I really like about hosting providers in general, the first is SSH access, especially the kind that’s granted by default when signing up. Simple Helix thankfully provide simple clean SSH access (not the ugly cPanel style java applet), which is something that I really appreciate. 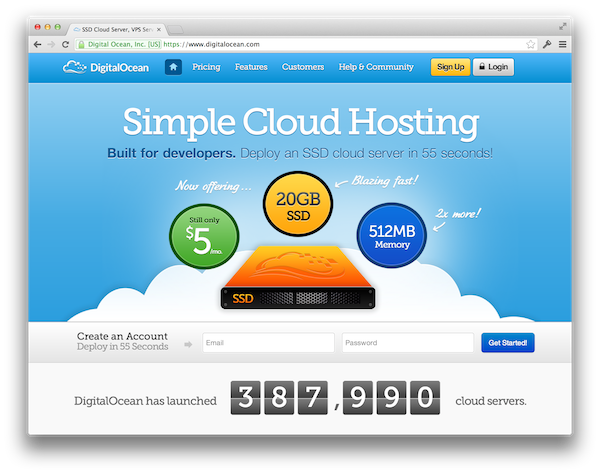 The other thing I find really helpful is the welcome email – hosting providers always send a welcome email. From a technical point of view I just love it when hosts lay out all of the hosting information in plain text, so I can easily copy paste it, without trawling through screens of fluff. Simple Helix scores points on both of these factors. But I’m sure if you don’t sign up for hosting every month, these kind of things are one off and you don’t really care! I bet what you do care about is speed, disk space and bandwidth (and possibly support?). So here’s my take on those factors. My initial reaction to the speed question was wow, good – their server pulled the Magento install down at 6MB/s – that’s close over a 10Mbps pipe, so I can tell right away that they have decent internet facing bandwidth. Another indicator of speed is the unzip of the Magento package. If it’s almost instantaneous then you know the hardware is modern, with Simple Helix this was the case. So I knew they had a decent connection and decent modern hardware. The only other question is: how many people do I have to share with! Because that really decides what kind of performance I will get. Being in New Zealand it’s always difficult to judge exactly how quickly a page will load for users in the Northern Hemisphere. That said, I found the Simple Helix pages loaded really quickly even way down under, and I know there are reports of that not being the case for everyone. One thing to consider is that some users may forget to enable caching for Magento, which is a sure fire way of slowing it down 3-4x, so always enable caching on production installations! Database setup was incredibly easy, they do not use the standard cPanel style interface, so the usually 3 step process was made simpler and much easier, probably really helpful for people doing their own installations that are not familiar with hosting panels. The last thing I noted was that Apache mod_rewrite was enabled by default, which I know may seem like an absolutely obvious thing for a hosting company, but I have been surprised by the number of them who do not do this! It is important for Magento SEO to have the rewrites enabled, and to use them, it’ll mean your URL’s can be of the form yourdomain.com/my-keyword-loaded-product-name.html which will help (hopefully). The price and specs of their plans; $20 for 50GB bandwidth and 5GB of storage and $50 for 100Gb of bandwidth and 25GB of storage are definitely at the upper end of the shared hosting spectrum. In fact for $75 per month you can actually get an Amazon EC2 server, which is what I do personally and highly recommend. I am working on an EC2 AMI for a pimped out version of Magento (with extremely high performance, data security and ease of use) – details to follow in the next couple of weeks. So what’s my conclusion, Simple Helix Hosting seems professional, modern, speedy and well configured for Magento. Their plans are $20 or $50, which is on the higher side, but it seems to me they’re worth it. If you’re in the market for Magento Hosting, Simple Helix are well worth trying out. Update: I just want to add that this review and my recommendation of Simple Helix is based on the short time I spent setting up and testing Magento on their platform. I have since read a fair bit of negative feedback about the stability of their hosting and I can’t really comment on this because I didn’t experience it. So please keep this in mind when you are considering my review. Also, I will add that I’d always recommend doing your own backups and not relying on your hosts backup support.